I received a complimentary box to facilitate my review. All thoughts are my own. Hey everyone! I’ve got another cool subscription box to share with you called LOVE GOODLY. 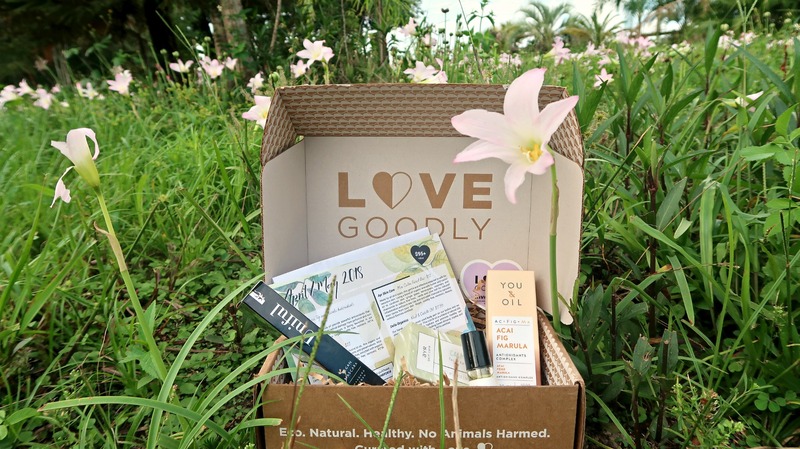 Love Goodly is an eco friendly, nontoxic, vegan and cruelty free bi-monthly subscription box that provides subscribers with high quality products every other month! The box I’m going to share with you is the April/May box! The theme for this box is Earth Day and it includes 4 mostly full-sized beauty and skin care items. Would you like to see what’s inside the box? Acai, fig seed and Marula oil provide powerful antioxidants that help protect and repair free radical damage from pollution and sun exposure protection. This oil serum is being launched in the April/May LOVE GOODLY box. It’s vegan, cruelty free, nontoxic, and PETA certified. This is a full size bottle that is 30ml and has a nice, fresh fragrance to it. This mascara is exclusive to Love Goodly! It’s organic and vegan and free of toxic ingredients and preservatives. It’s mild and long-wearing intended for healthy eyelashes, and is enriched with organic oils and waxes. It’s organic, vegan, cruelty free, nontoxic, and PETA certified. This is a full size product. Made for all skin types, this gentle and effective soap bar is safe for sensitive skin. Using a blend of organic avocado butter and castor oil to condition skin; ginger grass, lemongrass, rosemary, and chamomile to reduce fine lines; nettle and olive leaf for reduced inflammation and pure sea clay and activated charcoal to naturally draw toxins from your skin. It’s vegan, cruelty free, nontoxic, and Beauty without Bunnies certified. This is a mini size, but since it’s a facial bar, I feel like it will still last for a really long time! It’s so pretty in person and it smells AMAZING! Our hands are the #1 most used body part on our bodies and we often forget about their care. This cuticle oil is a blend of natural oils and essential oils that help hydrate and promote healthy nail growth. A blend of natural oils including Sweet Almond, Jojoba, and Rosehip. It’s vegan, cruelty free, nontoxic, and PETA certified. My cuticles could use some TLC, so I’m really excited to try this out! Overall, I think it’s a really great selection of quality products and you get a ton of value! The retail value of this box is actually over $95 and the LOVE GOODLY subscription boxes only cost $29.95 so it’s an incredible value! I love that most of the products are full-sized so you really get a chance to try them out. I love that I can try and discover new products I’ve never heard of before! While I don’t personally live a totally organic/vegan lifestyle, as a mom I enjoy knowing that the products I choose to use are good for me. The fact that everything in this subscription box is safe and good is really neat! If you are someone who loves organic products, this box is for you. If you’re someone who loves to try new beauty and skin care products, like me, this box is also for you! Subscribe to Love Goodly & Make a Difference! LOVE GOODLY supports a charity partner with every box. This box is supporting Peta. The June/July box, scheduled to ship on June 5th, will be supporting Paw Works, a nonprofit animal rescue organization dedicated to partnering with county and city shelters to give abandoned animals a second chance at life. So if you’re interested in discovering some great, safe new products, while also supporting a socially conscious business, head over to LOVE GOODLY and get your subscription started!! If you use code LOVELINDSAY at checkout, you will get $5 OFF your first Essential or VIP subscription box, prepaid 4-month or 6-month box, or single box gift! p.s. You can ALSO shop products individually on their website! What did you think of Love Goodly?